my mom gives me a hard time about this. 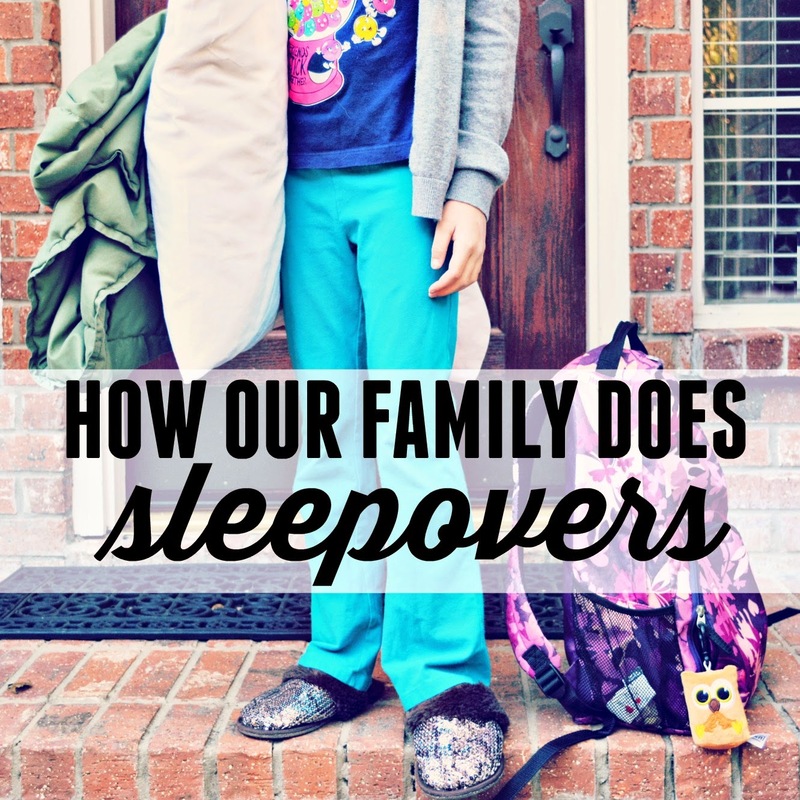 sleepovers, that is, and the way our family handles them. our daughter is 9 and sleepovers seem to be The Thing To Do among her peers. well, our family has made a decision and taken a firm stance on how we do sleepovers. i remember my first sleepover. i was 7 or 8, maybe 9, when a girl down the street invited me to stay the night at her house. it seemed like a great idea: my first sleepover just doors down from home. the girl's parents were hosting a dinner party that night, so the plan was to feed us and send us upstairs to stay out of the way and entertain ourselves while the grown-ups did grown-up things downstairs. upstairs, the girl and i played with a huge makeup kit. we put on bright eyeshadow and bold lipstick and colored in our eyebrows. we played in front of mirrors and felt so grown up ourselves. we were fancy! and then somehow we knew it was time to wash off the rouge and get into our pajamas. the girl smeared a cream all over my face, calling it makeup remover. at first it was cold on my skin, and then it burned. it hurt so bad. it got in my eyes and i couldn't see anything. but i had to keep quiet and not disturb the adult party downstairs. it was awful and i wanted to go home. so i did. i don't remember how, but i went home and cleaned the Icy Hot off of my face and slept in my own bed. safe and sound. as i got older i went to more sleepovers and survived them just fine. but my memories of sleepovers aren't always pleasant ones. i did bad things with my friends when the host parents went to sleep. i'm talking mildly bad things and really bad things and every bad thing in between. i did things i would never do when the parents were awake and watching. i ate entire bags of powdered donuts and Doritos. i made prank calls. i said bad words. i watched R-rated movies. i gossiped and hurt other girls' feelings. i flirted with big brothers. i snuck out of the house. i lied. and worse. i put myself in dangerous situations. i tricked myself, with my friends, into believing that after dark i could get away with anything. and in the mornings when the sun came up, i went home sleepy and grouchy and ashamed. but i anticipated the rush of the next sleepover. these memories only resurfaced when our daughter recently started asking about and being invited to sleepovers. unfortunately there isn't a chapter in the What To Expect series on How To Handle Sleepovers. and since that's where i did most of my parenting how-to research, i was not prepared for The Sleepover. i was like a deer in the headlights when our 7 year old was invited to her first sleepover. my husband and i talked about it, prayed about it, and we let time pass and circumstances arise before we came to the decision on how our family would handle sleepovers. we took all things into consideration, thinking through all the scenarios that might come up. we decided to make a family rule: our children would not be allowed to spend the night at their friends’ homes. we don't do sleepovers. it's what's best for our family. when our daughter is invited to sleepovers, we take her to the party and bring her home when the sleepover is winding down for the night- when the movie is over or when the host parents call "lights out." we go home and sleep in our own beds and we are safe and sound. this way, she gets to have fun with her friends, but isn't left in a situation that is potentially dangerous or makes her vulnerable. we got a little bit of pushback because EVERYONE ELSE IS STAYING THE NIGHT but we are becoming quite familiar with the go-against-the-norm take-the-narrow-gate conversation. we encourage her to make the most of her time at the party, not dwell on what she will miss out on after dark, and hope that she trusts that we are doing the right thing for her and for our family. and even though my mom gives me a hard time about it, i have found we are not alone in our decision to not participate in sleepovers. several friends in the same season give me an understanding nod in agreement, or they contemplate making the same decision for their family, when they hear our opt-out decision. when the conversation comes up, we're forced to think about what happened at sleepovers in 1989, and what could happen at sleepovers in 2014. it's enough to make a parent want to take a stance for the sake of their family. who knew sleepovers didn't have to be the norm!? there have been rare and special situations where she and i have both stayed the night at a friend's house. that's right. we went to a sleepover and i stayed the night with her. it's a situation where i am friends with the mom and my daughter is friends with the daughter. i have done this twice now and i wouldn't have it any other way. at the sleepover, i'm careful not to "helicopter," but engaged and available. i'm there to have fun and let her have fun, but also to pull her aside or give her a look if necessary. both times we've gone to a sleepover together, i'm thankful to have been there to help braid her doll's hair, give goodnight kisses, and share powdered donuts at 1AM. back at home, after attending sleepover pre-parties, i stay up a little later with my girly. we talk about her friends and the party games. we tell jokes and giggle, and then i tuck her in to her own bed. and in the mornings when the sun comes up, she is sleepy but happy, anticipating the joy of the next un-sleepover.